Do you have all the information on your freight carriers perfectly organized? Research shows that even Fortune 500 companies do not have effective systems in place for continuous monitoring of their freight carriers. Vetting during RFPs is not enough! When highway accidents happen, the attorneys are close behind. Are you ready to produce your due diligence file on every carrier you use? Building partnerships with our clients that are rooted in personalized service, honesty and integrity is the foundation on which our business is built. Automate your Carrier Pre-Screening process with our Online Carrier Profile and shop for new carriers amongst Shipper Shield Registered carriers! Continuously monitors your carriers and e-mails you if a carrier falls below your tolerance levels. ShipperShield is helping us make significant strides toward effective monitoring of the safety of our contracted carriers! Your systemic solution is light years ahead of our former process and is also cost effective! At Shipper Shield, we’ve found that we can actually serve our client’s best interests for carrier vetting and in the process save carriers a lot of time. Let’s say you have 20 shipper clients that use Shipper Shield – well then you as the carrier need only fill out a single profile in our system and your information will be available to all 20 shippers. This way, you can focus on providing a really complete, really thorough carrier profile once, and you will see a lot of time saved by not having to deal individually with each of your customers. It is our goal to provide carriers with opportunities to supplement publicly available data with FMCSA action plans, accident reports and other information that can balance a shipper’s perspective. We also welcome carrier feedback on improvements we can make to our system. 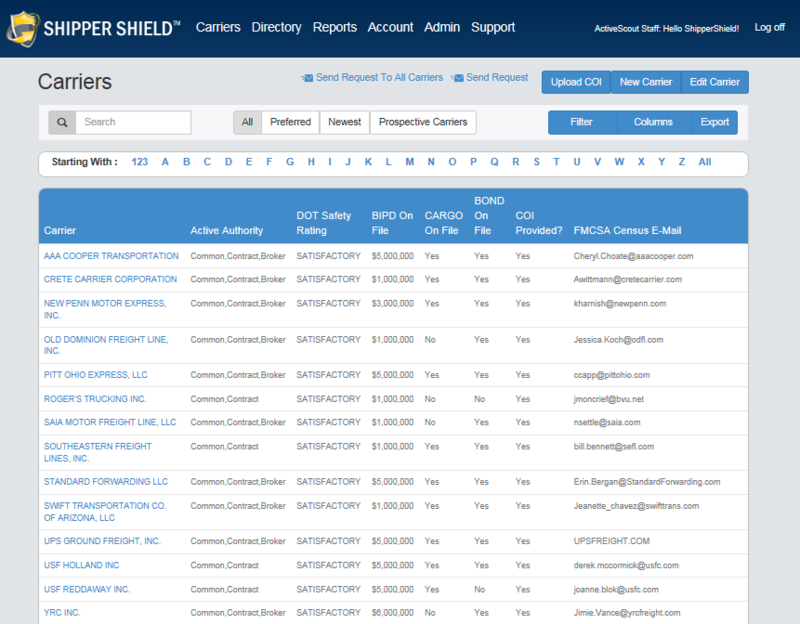 Providing carrier profile information to Shipper Shield is an exercise in proactivity. We believe that carriers who welcome viewing of their authority, safety, insurance, financial and operations information deserve favored treatment over “stranger carriers” who only submit information required by law. Allows them to monitor their supply chain risk through holistic oversight, and provides the education to make decisions to eliminate exposure and engage in safe ´next´ practices. Our proven track record and position on the pulse of the transportation industry allows us to provide valuable counsel to all of our clients.